"From far, from eve and morning and yon twelve-winded sky, the stuff of life to knit me blew hither: here am I. ...Now -- for a breath I tarry nor yet disperse apart -- take my hand quick and tell me, what have you in your heart." I was late for an engagement this evening. An event was intended to start at 9.30. Earlier, I was asked to lend assistance in the physics department, so over to the library I headed, where I met up with the Nebraska possibles, and a couple others. We had a good time, what with chatting and working on problems, but then I realized it was 10.00, and so I started packing up my things. I kept apologizing, again and again, for not being very helpful this evening -- I just wasn't able to be of much assistance. They insisted I was wrong, that I had been of great help, and that "just having [me] there made it so much better." Not only that, though. These gentlemen felt bad that I was going to be late. They wrote me an excuse slip. It reads, "Please excuse Amelie. She was very useful." All four signed. if not a little confusing when certain people catch your eye. or, you catch them looking at you. and, when asked "what?" they keep smiling. "i'm just happy to see you." and 2, I was kidnapped this past Friday night. It's okay, though, I was only kidnapped for about 1.5 hours... Perhaps I should explain? I received a phone call around 5 or so. It was Nebraska suspect #1. [Neglected to mention I had suspects...] He asked what I was doing that evening. The only thing I had planned on doing was going to the Improv Show [big fan] at 7.30. He then asked if he and Nebraska suspect #2 could come over around 6, and I assented. 6 came and went, as I sat there, doing Sudoku and waiting for them. The phone rang 15 minutes later; they got confused as to where in the building my room was located. Needless to say, they had searched the bottom floor of the other tower thoroughly. As soon as the mistake was corrected, they arrived, and asked me to go for a stroll. I grabbed a coat [it was -12 without factoring in windchill...] and we headed out. Said stroll was apparently to take us to guy #2's car, into which we climbed, and drove -- the LONG way, to warm up -- into another part of town. Turns out they were taking me to the coffeehouse in town. I had never been there before, and had had almost nothing on the menu before. The local band was setting up, and we stood talking for a little before they informed me that they were treating me to whatever I wanted, as a Thank You for my assistance with physics. About a month ago, I received no less than 6 distress phone calls from 5 guys working together in the basement of the library in the conference room. They were trying to figure out physics, and yes, they were desperate enough to call 6 times! I helped them for about 3 hours [we all did very well on the assignment, by the way]. They were all being very, very nice, making sure no one offended me, as they anticipated needing my help in the future. [These are also very chivalrous guys; they've held the door for me multiple times, got me things I needed, etc.] I was even added to guy #1 and guy #2 's cell contact lists, #2 listing me with the name "Emergency," and #1 with a typical play on my name [those of you who know my name can probably figure it out]. Since then, I have helped them a number of different times. They also have me keep an eye on the mail they get, so that they'll know when things come. Now, because guy of #2, guy #1 gets a LOT of mail from the offices of various governors around the states -- which is one of a few reasons he's suspect #1. Anyway, we sat there in the coffeehouse, taking in the setting up of the band, talking together, drinking our strawberry smoothies [in the case of guy #1 and myself] and hot chocolate [guy #2]. We did talk about physics for a little bit -- we had a test that day -- but we also talked about other things, too. No talk of the pin, though! Suddenly, guy #1 asked me when Improv started. I reminded him, and he said, "...That was three minutes ago." I was shocked! They detained me from Improv! I asked if it was intentional, and they said no at first, but in trying to have me look at the positive side of things, said something about how they'd worked it so I could get in free now -- sounds pretty intentional to me! And thus, I was kidnapped for the first time at college. What guy in his right mind would send, in the on-campus mail, a little paper packet, to me, and in this little packet is a piece of an index card, which says "Did you hear about the nearsighted porcupine? He fell in love with a pincushion" and had a pin of Nebraska attached to it? Does it mean anything? Inquiring minds need to know. Update: Did I mention the Nebraska pin says "possibilities ... endless" on it? ...when the amelie gave blood today. Unlike last semester, when the iron count was just barely too low, I made it this time. So they sent me over to actually donate blood, after the rigmarole of paperwork. My technician was really quite nice. She marked the vein right away, doublechecked it, and then asked me to look away. I did for a second as she brought the needle close, but then I watched the rest of the time. I don't have a problem watching; I find it fascinating. Before the mathematics major, I was leaning toward medical. Anyway, my technician stuck the needle in... and immediately couldn't find the carefully marked vein. She tried a few more times, without success, before calling over another worker, named Michael. He apparently takes the hard cases. Well, he tried three times, and couldn't get me. They kept worrying about if I was alright, and I was just fine -- I kept telling them I wasn't worried, and that I had no problem with any of this; that I wasn't in pain and this was kinda amusing. They called over one more lady to try a few times, ask me if I was alright four more times, and then they switched to my left arm. They set Michael to it right away, and this time he got it. We talked about the last time I gave blood [junior year of high school; I had a presentation that day, and they took it from my left arm -- the writing arm. I was the first one done, got up, drank some lemonade, and went back to class]. Overall, it was a pleasant experience. I filled the bag in just a little over four minutes, let them fill the little extras, got up, drank a cup of water, and left. Now I've just got the battle scars, which will be gone soon enough. So, be nice to me. 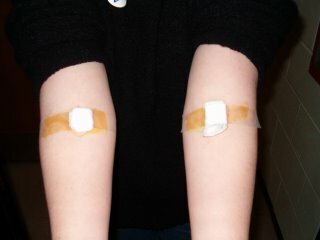 I gave blood today -- and got stuck twice for it. And lovers leave cold, empty beds. Apparent joy upon their faces. And left the other's warm embraces. The former found in no known places. Now wears the black inside the head. Leaves lone lover, better off dead. If you wait too long for the perfect moment, the perfect moment will pass you by. Sometimes, secretly, I actually enjoy life.